Is it possible that a PowerPoint presentation can make the difference between winning or losing a case? There is scientific evidence to show that PowerPoint can help achieve the desired results. According to formal studies conducted by Neil Feigenson of Quinnipiac University, and Jaiyhun Park of Baruch College, a well-designed PowerPoint presentation was shown to exert a measurable effect on jurors. 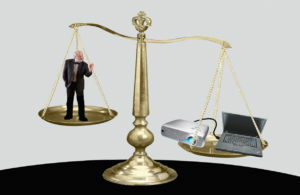 Their studies showed that a plaintiff who uses PowerPoint to present statistical evidence caused a mock jury to find the defendant to have greater liability in the case. Moreover, this approach works the other way around if the defendant uses a PowerPoint presentation to rebut the plaintiff. From a scientific perspective, viewing statistical and numerical evidence rather than just hearing it described, has more influence on human perception/cognition. This psychological effect leads to a deeper understanding of the data and, consequently, makes it easier to recall the facts later. It has been found that viewing statistical evidence on a PowerPoint slide causes jurors, and others, to concentrate their attention with greater focus than listening to the same information verbally described. A skilled personal injury lawyer looks at all evidence to understand every relatable detail that occurred before, during and after his client’s incident. The lawyer knows the client’s life story, visits the scene, and talks with eyewitnesses. However, what about the mediator, the judge, the opposing attorney and, of course, the jury. What is the best way to show them the true story? As proved in the Feigenson and Park study, individual jurors are impacted more by seeing evidence than by simply hearing it described to them. When it counts, jurors remember the visual evidence, and take that image into the jury room. In a recent case in Connecticut, Geomatrix created a PowerPoint presentation for the co-defense attorney for his closing argument. The co-defendant (an insurance company) wanted to convince the jury to award a much lower dollar amount to the plaintiff than being requested by their attorney. Was it the Message or the Messenger? As noted previously, the PowerPoint tool facilitated the visualization of evidence in such a way that the jurors could better understand the message and recall the facts during their deliberations. However, if the message were not ‘spot on’ with the salient facts, the PowerPoint presentation would not have been effective. Of the two media elements, the tool and the content, content had more impact on decision-making than the tool. With that in mind, creation of ‘spot on’ content requires the most time and expertise. To learn more about video technology, contact Geomatrix Productions. We lead the field in the design and execution of comprehensive digital trial presentations while continuing to provide premier legal video production services.